Following news of many new signings over the summer, we now bring you news of temporary transfer outward. Popular goalkeeper David McGurn has gone out to League One side Stranraer on a season long loan deal. At this stage of his career, Davie is understandably keen to be playing regularly at a good level and with such strong competition for the 1st team gloves from Kevin Cuthbert and Ross Laidlaw, it was felt that regular game time could best be achieved by going out to play for Brian Reid’s men. The terms of the loan deal are obviously confidential, but we can confirm that there are clauses that potentially may result in Davie’s early return in certain specific circumstances. Supporters will be well aware that the stopper signed a two year deal at the end of last season, and he therefore remains a player contracted to Raith Rovers for that time. It goes without saying that everyone at Stark’s Park wishes Davie every success in his loan spell, particularly tomorrow for reasons that will be apparent if you look at the Stranraer fixture list!! Meanwhile, in other news, a former fans’ favourite’s career progression is yielding a modest but nonetheless welcome benefit to Raith Rovers’ coffers. 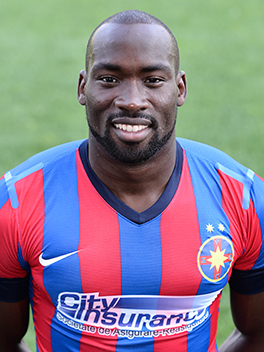 Gregory Tade, whose transfer from FC Cluj to Steaua Bucharest this summer, means that Raith Rovers receive a small sum in relation to a Development Contribution under FIFA’s Solidarity Mechanism.